I have no experience backpacking. In fact, I learned how to properly use trekking poles for the first time about a month ago. But what I lack in experience, I make up for in enthusiasm. In order to train myself for my wildly impending thru-hike, I have been deliberately placing myself in situations that would normally scare the willies out of me. I’ve gotten up close and personal with bear, learned how to stay warm in freezing temperatures, conquered my first night hike, pitched a tent through the snow, and even gone for a hike run through a violent thunderstorm. I can’t chase a perfect hike… so instead, I’m going after bravery. And there I went. La la la LA! After receiving my very official-looking backcountry camping permit and a measly three line map, I set out on the trail. I hadn’t known what to pack and instead just threw ALL the camping gear I own into my new flashy backpack. It weighed 40 pounds, but I figured it was good training. 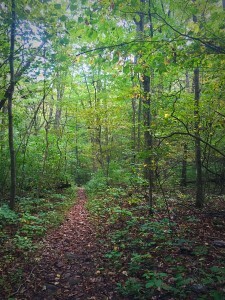 The Appalachian Trail only runs about five miles on the loop I had chosen, a total of 18 miles. The AT stretch felt particularly breezy, although I did have to stop every few minutes to take some many pictures. 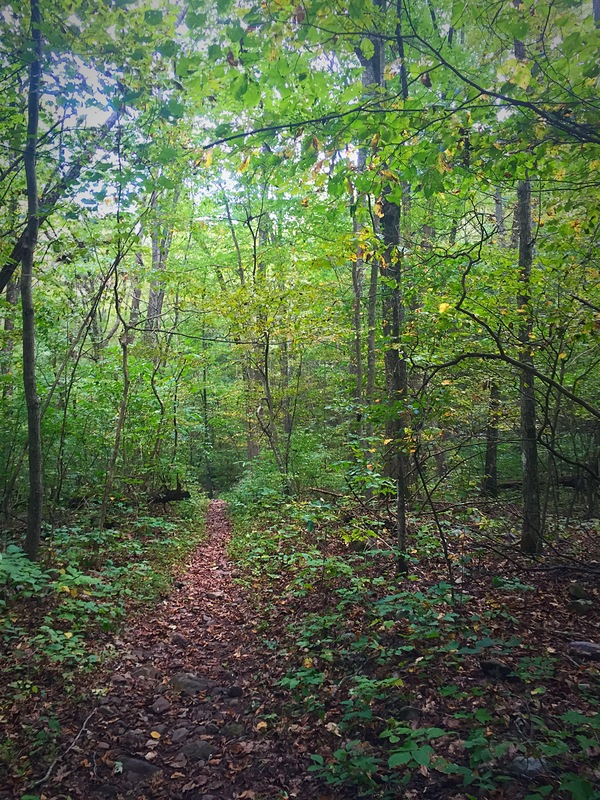 As soon as I turned left off the Appalachian Trail, I dipped into the steep descent of a valley. The trail grew narrower and the dense trees grew taller. Suddenly, I saw a creature of sorts… About hip-high, sleek and black. My honest first thought was, “Wow! I didn’t know they have jaguars here!” Then I realized it was a bear. Not only did I see my first bear that day, I saw FIVE. The next sighting was a mom and two cubs drinking from the stream. I surprised all of us as I came sauntering around the bend. Yes, there was a thundering voice shrieking inside of me that I was about to DIE, but I chose to instead listen to the bouncy and bright idea that they were all actually pretty cute. I wondered how close I could get to them. We all stood there and stared at each other for a little while, and eventually they scampered up the mountain. Two miles later, my head in the clouds taking more pictures, I saw ANOTHER bear running in my direction from behind. He was not cute. Luckily, he saw me in time to turn and run the other direction. I hiked about 10 miles that day before I stopped, setting up my hammock with my back to the stream. I figured should any animals chose to visit in the night, at least I could hear them. …All through the night it seemed. I lay there in pitch black, cocooned in my hammock, with my emergency whistle in one hand and my compass in the other. I was terrified. I actually devised a plan to take only my headlamp and water and run my scaredy-pants the ten miles back to my car. Mentally working the logistics of this plan lulled me in and out of sleep. I heard something again. This time it wasn’t just branches breaking and leaving rustling… it was the deep, low guttural and raspy breathing of a bear. He was right outside of my flimsy hammock, sniffing me out. Surprisingly, I grew brave. I started talking to him. I put on my best baritone voice, pretended I was Michael Clark Duncan, and said hey. I probably spouted twenty different types of salutations, trying to get my voice deeper each time. He went away, and guess what? I fell asleep. I woke up in the morning to sounds of birds chirping. I made it through the night, and I was alive! You bet your bottom dollar that as soon as I returned home, I spent three hours online researching bear behavior and interactions. While I still have a lot to learn, I am proud of myself to have caught that sweet slice of courage. Without courage, you cannot truly possess any other trait. Also, maybe I should consider a tent. Howdy, I'm Stephanie. If we happen to meet on the trail, meow at me and we will probably be best friends. 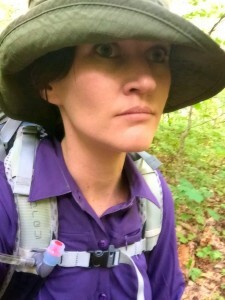 Thank you Stephanie for your honest and insightful feelings about hiking the AT! I too share some of your fear but have only gotten where I am today by facing my fears and that will be the mentation I carry with me during my thru hike I have planned for 2017. 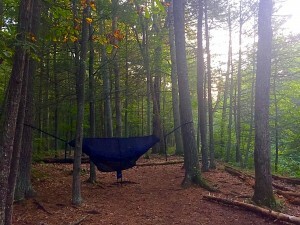 I’m just curious, what may be swaying you from your hammock camping? Was it the encounter with the bear or are there other factors? I only ask as I am also planning to thru-hike with a hammock. When everything was said and done, it would have cost me more money to purchase a new under quilt, over quilt, and tarp than it would to buy a new tent. A matter of personal preference, but I didn’t like using a sleeping pad with my hammock. I was discouraged that I would likely need to buy one of those, too, for when I had to use a shelter. Since I’m new to the backpacking world, all those items were too big of an expense for me. Lastly, while I know I would get more comfortable sleep in a hammock, I am opting to have the comfort of a shelter in form of a tent. It’s like my own mini-room for when I want to sit up, sprawl out in any direction, wait out the rain, etc. But these are ALL my personal reasons. 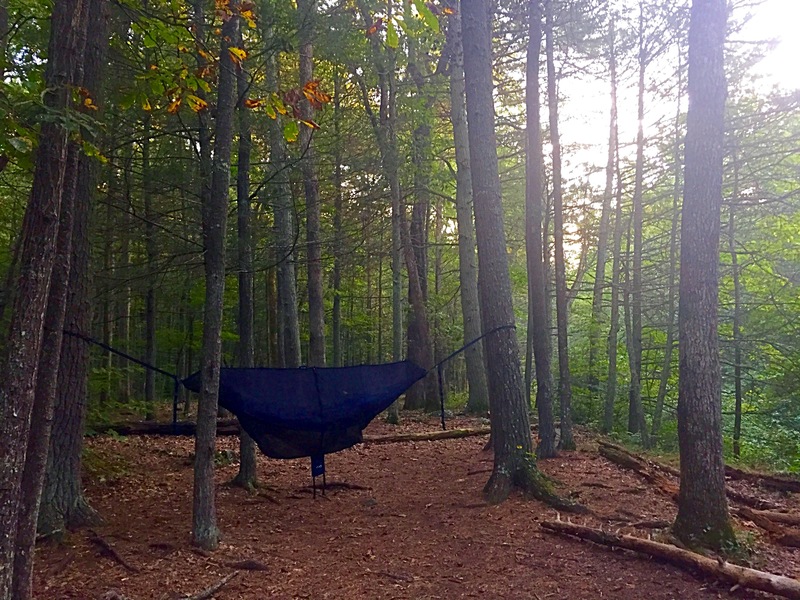 I was lucky enough to keep my original hammock, and I may have my husband send it to me during the hot weather sections of my hike. Good luck with all your planning and practice hikes, and keep that inspiration blooming! Looking forward to reading more of your adventures! Thank you, Sarah! Momentum is a great thing, and this kicked my ball of bravery into high gear for sure! I may need to channel you the next time I feel like I am being watched in the brush by a family of bear. I cannot imagine the strength of courage that you mustered while a bear sniffed you in your “taco shell” of a hammock. Way to go, keep it up and keep posting! I Love it! You are such a great writer! I loved your story.. I am a woman who longs to retire and walk the trail.. I will be following along.. And cheering you on! When are you leaving for your hike?I step off on 7 April. My son and I have seen many bears on the AT between springer and midpoint in the smokies. The first one woke us up at midnight crushing a kids water bottle for Gatorade. The kid was in a hammock with his pack tied to the tree at his feet. The bear at blood mt shelter shredded his whole pack. I watched with a pistol in hand not knowing if I should rescue the kid. Next the bear walked right to my tent door. ( I could smell him) I thought if he sticks his head in the tent I’m unloading on him. He walked on by about 4 feet away (we hung our food on a bear line at the shelter) we were scared but since then we have seen many bears and even cubs. I don’t carry anymore on the trail, don’t want the extra weight and I’m not scared of bears anymore. I ALWAYS hang my food and I avoid shelters. Most bears run away so fast you can’t get a picture and the ones that stay on the trail we just take pics and walk around them! I’m with other men and my grown son but if I were a woman I’d carry a airlit 38 and it wouldn’t be for bears.